Dine In or Pick Up! If it’s pizza night with your friends or family, stop into Johnny Manhattan’s, or give us a call to place an order to go for one of our made-to-order signature, hand-crafted, 16″ pies. 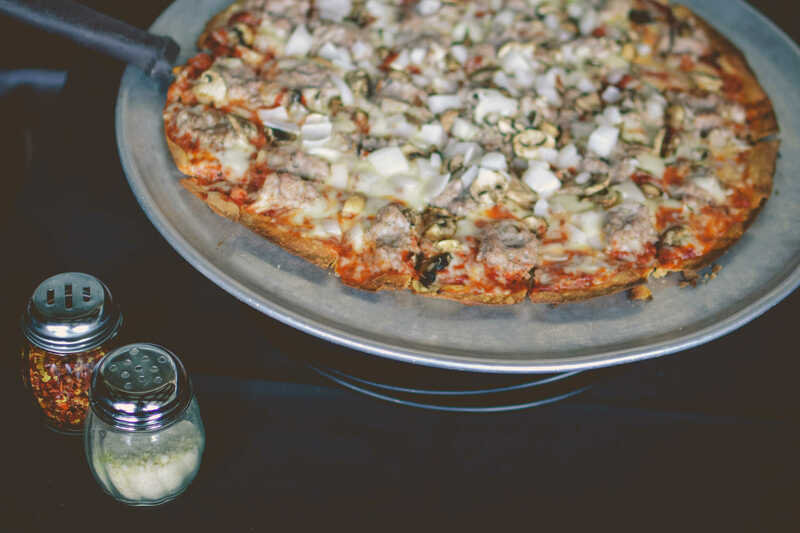 Try one of our specialties, like The Manhattan or Nana Rosie’s favorite, or build your own by adding any of our fresh toppings, like fresh mozzarella or artichokes. Paired with any one of our delicious appetizers, like our lightly dusted deep-fried calamari, or haystack onion rings, your meal will be complete! We even have people traveling from Waukesha and Milwaukee to try our famous, delicious pizza! We are voted in the top 10 for Best Pizza in Richfield by Yelp! We serve patrons who come from all over the Milwaukee, Waukesha, & Washington County WI areas including Richfield, Germantown, Menomonee Falls, West Bend, & Hartford!